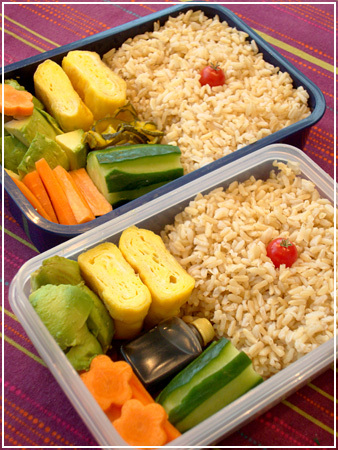 Swedish weather and general stress levels have had a serious impact on my bento mojo recently. When even my coworkers started to complain that they hadn’t seen any pretty, happy lunchboxes in a while I knew it was time to make some again. Brown rice with the last of this season’s cherry tomatoes (we cut them down now and will be replanting as soon as we get reliable periods of sunlight again), cucumber, carrots, avocado, tamagoyaki and soy sauce. My box also has some quick-pickled zucchini which the BF didn’t like as much. A small box I made sometime before Christmas already, but forgot to post. 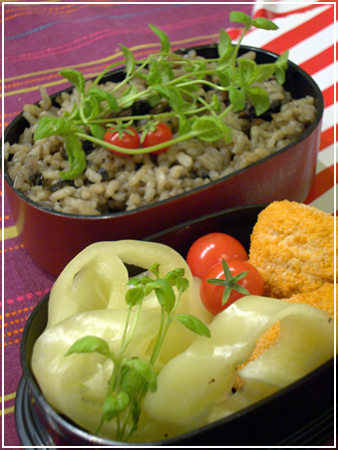 Mushroom risotto with cherry tomatoes and herbs as decoration, white bell pepoers, more tomatoes and some chili cheese wedges in the small box.